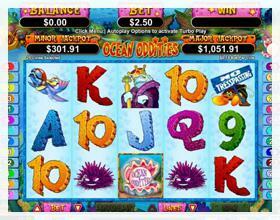 Ocean Oddities is our new game and we want all of our members to hear the great news. This five reel slot machine from Real Time Gaming has come to our casino to stay and we’re very excited to introduce to you this great winning opportunity while having great fun with its colorful creatures. Rex the Shark, King the Fish and Pearl the pearl are a few of the friends that you will make when you first dive into the depths of the ocean with every spin of the game. Between one spin and another, you will be able to have the chance to win up to $1000 or reach the top award which is 40,000 times per bet line. We invite you to check out the abundant features and some of the guidelines pertaining to this cool new game. During the feature each Rex doubles the prize when substituting. Palace of Chance Casino guarantees that you will have an exciting adventure with this new game. Remember there’s also the chance to win 10 FREE games and in case we haven’t emphasized it enough, its characters will charm you and make you want to continue playing until you reach those desired prizes. You’ll see!